What is the Orloj ? Basically, the Orloj is a clock with a history line better than a Grisham novel plot, (see below). 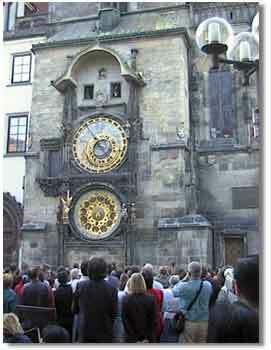 It does astronomical 'things' and also entertains about every tourist who comes to Prague for at least three minutes. The famous saying "See Naples and die" can be used in the case of the Orloj but we suggest in modifying it to "Don't die before you see the Orloj ! ". ......well if it weren't for the appearance of the Apostles, who 'do their thing' at the chime of every hour, watching the Orloj - for most people would be like waiting for a plank to warp. But the combined beauty of the Orloj, the hourly mechanical 'show' and above all - the crowds that gather below it, even with still 15 minutes to go... make it a most fascinating event to watch and to be part of. Standing under the Orloj at the chime of the hour is not just simply gaping at an old clock. It's an experience that everyone who comes to Prague should undertake and only then will you understand the real magic of the Orloj. What does the Orloj actually do ? The walk of the apostle - top. The Sphere or Clock Dial - center. The calendar - lower part. The walk of the Apostles. The Apostles come out of the windows in the upper part of the Orloj. St. Simon follows holding a saw being the patron saint of lumberjacks. 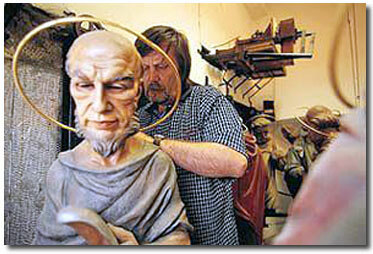 First is St. Peter with a key and he is the patron saint to fishermen, locksmiths and clockmakers. St. Mathew is next with an axe and is the patron saint for builders, carpenters, blacksmiths and butchers. St. Jacob with a tool for working flax being the patron saint of linen traders. In the lower parts are the other fixed statues - Death represented by a skeleton pulls the bell cord with one hand holding the clessidra in the other. 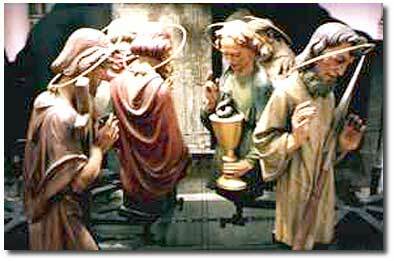 The Apostles come out in a procession - this happens in the top part of the Orloj. When done they then go back inside. Once the windows close, a cockerel flaps and crows in an alcove and then the chimes of the hour can be heard. This parody is accompanied by the Turk shaking his head, by the Miser watching his bag and Vanity admiring himself in a mirror. On both sides of the clock dial and of the calendar there is a pair of moving statues. The four figures at the top, in the medieval times were seen as the four menacing elements for the city of Prague. These have moving parts although they themselves remain where they stand all the time. A Turk - also called The Piper. The four figures at the bottom, represent virtues and are immobile. The Sphere or clock dial is the central part of the Orloj and represents the astronomical phenomena such as sunrise and sunset, ancient Czech and present day time, movements of the Sun and the Moon and other relative celestial configurations. and the apparent revolutions of the stars (the ecliptic, to be more precise). The horizon is indicated by the boundary of blue and red; in the left part the day-break (AVRORA) with a rising border (ORTVS), in the right part the twilight (CREPVSCVLVM) with a setting border (OCCASVS). The dark circle at the bottom displays the astronomical night. In the clockwork there are three great co-axial wheels of the same diameter, driven by the same pinion, with 365, 366 and 379 cogs. 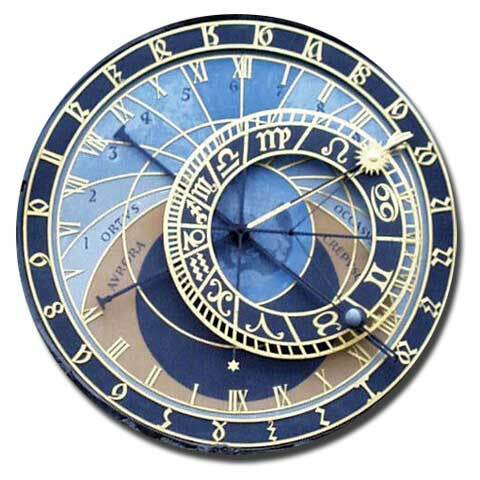 The first of these gearing the zodiac and the indicator with the asterisk rotates once a sidereal day. The second gears the indicator of the Sun and rotates once a mean solar day. The third gearing the Moon's pointer rotates accordingly with the mean apparent motion of the Moon. The ball, half silvered and half black, rotates every synodic month and displays its phase. 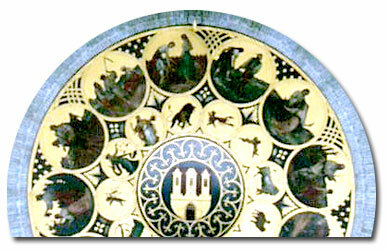 The Calendar is the bottom part of the Orloj with month symbols painted by Josef Manes in 1805. The originals of these can be found on the sides of the stairway of the Prague Museum of History. See Orloj history below for more. The concept of the Orloj as an astronomical clock, was to represent the course of the sun and stars just like the real thing and the main task was to show with precision the exact point in the afternoon when the sun was at it's highest. This is why the Orloj was always timed to the real sun time using sun dials (vertical sticks dependant on sun and shadow to measure time). In times when clock works were imprecise in maintaining their continuous precision, it was necessary to keep correcting them, comparing clocks with other clocks and the best way to do this was according to the then sun clock measurements - the sun dials. Initially- clocks, the Orloj included, were 'tuned' according to the local sun position and had to be continually 'corrected' accordingly. In fact there were two sun dials on both sides of the location of the Orloj clock and the remains of these on the Old Town Hall walls were visible until 1911 when they were removed. As the development of clockwork mechanisms progressed, soon clocks could run with more precision than sun dials and were based on the central local sun position. These were the basic starting phases of the Orloj. Astronomers then came to worry about time precision by synchronizing the precision of clocks according to star configurations and their movement around the Earth. Further developments in clockwork mechanisms made it necessary or viable to be able to divide time into units. The Orloj, also known as The Prague Astronomical Clock is one of the oldest European clocks of its kind (the first ever originated in Padua in 1344 and a second in Strasbourg in 1354) and continues to hold its exceptional position. It is unique in being the oldest of those where the original clockwork has been in operation from the beginning to the present time for six centuries, and even the astronomical dial shaped like an astrolabe survives in the original form. 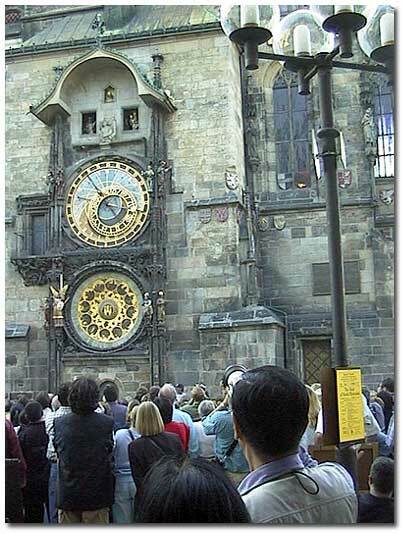 Interestingly, the Clock initially showed exclusively astronomical data and there were no irrelevant little mechanical figures to entertain the common people but only "the pure art of astronomy". The original lone tower housing the present day Orloj was built in 1381. The initial clock was installed in 1410 by clockmaker Mikulas of Kadan with the astronomer and professor of mathematics at Prague Charles University - Jan (Ondrejuv) Sindel (see below about him). The craftsman Hanus Carolinum. - originally accredited with the Orloj concept actually only did some repairs in 1490 and in this second phase is reputed to have added the calendar dial under the astronomical dial. 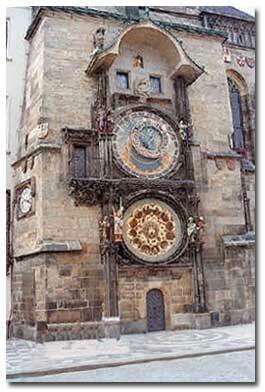 According the legend - the councilors blinded Hanus so that he could not recreate another similar clock in any other City. Before he died, the blind Hanus climbed the tower of the clock and took revenge by damaging it and causing it to stop. At that time - the entire facade of the Orloj was richly decorated with striking Vladislav Gothic - which is the Czech equivalent of Flamboyant Gothic - stone sculptures. The important exceptions are the sculptures flanking the astronomical dial and mask and figures on its architrave which were created at the beginning of the 15th century by members of the masonic lodge of stonemasons and sculptors led by Peter Parler. Between 1552 and 1560 major repairs were done by Jan Taborsky. Around 1566 the Orloj was completely mechanized and the tasks of the Orlojners were to wind all four mechanisms, to monitor the working of the clock and to 'fix' any errors or breakdowns when the mechanisms went out of sync. After that the Orloj kept running from bad to worse until it stopped completely. Small repairs were undertaken after the thirty year war (1618-1648) in 1648 but got the Orloj running for only a few weeks at a time. Towards the end of the 17th century the new statues were added - moving statues in particular the Death that tolls the bell by the side of the astronomical dial and immobile ones alongside the calendar dial were added, but there was no money for major repairs and worse still, no capable watchmaker was found to do more technical repairs. Worse to come - in 1787 the whole mechanism nearly went for sale as scrap iron. Watchmaker Jan Landesberg partially came to the rescue trying to repair the mechanical part ... but he was not very successful. Major restructuring of the whole Orloj in the 1860s gave it the present day aspect. In 1861, when the clock stopped working the Orloj was up for sale once again as the 'Town' didn't have the 4000 gold pieces necessary to save and repair it. Fortunately, a collective sum was raised and the Orloj was not sold. Unfortunately in 1864 due to a fire the Apostles statues from Eduard Veveleho were destroyed. In 1865, Jan Holoub under the supervision of watchmaker Ludvìk Hainze from Prague and under advice from F. Bohm repaired Orloj. During this repair (end 1865) a new calendar disc was installed, made by the well-known Czech painter Josef Manes. The cycle of twelve medallions of the Months and the same number of medallions of zodiacal signs is one of his culminating works. These today have been replaced by a copy from Bohumil Cilli and the originals are in the City Museum. On the 4th of January 1866 Alexander Dumas, on his way to Dresden with his daughter, stopped in Prague and paid a visit to the Orloj. On the 18th of August 1866 the Orloj was unveiled amidst festivities as 'he' had been finally repaired to the state that we know today only to be closed down to have all the mechanisms re-lubricated , the last defects repaired and mainly to connect it all together so that the calendar plate would also work. Finally on the 14 th September 1866 the Orloj was functioning as everyone in the past 400+ years involved had envisioned. From this time the Orloj was maintained by Ludvik Heinz, after whose death in 1874 the maintenance was done by his son Ludvik Heinz and from the year 1901 in turn his nephew - another Ludvik Heiz. In 1945 the whole structure - tower, mechanism - was damaged during the final phases of WWII and the Prague uprising. During the fighting in Prague the Nazis directed artillery fire at the Old Town Hall and even used fire grenades. The entire building burnt down and with it the complete City archives burnt to ashes. Nevertheless, a number of self-sacrificing persons managed to repair the authentic old clockwork. The original figures of the Apostles have been replaced by the creations of the woodcarver Vojtech Sucharda after the end of the Second World War. The Orloj was renewed in every respect in its original form three years later in 1948- on the 1st of July, and once again started to function and to chime with new statues and new versions (copies) of the Mànes calendar in place. 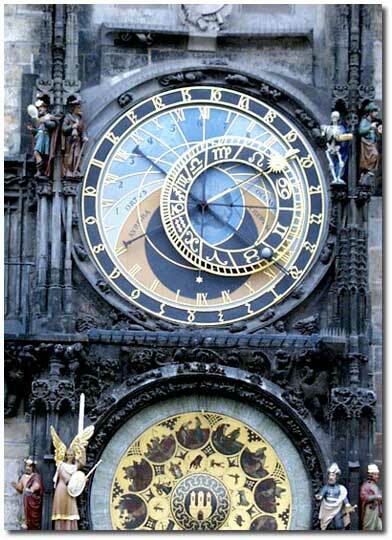 "Orloj [Prague's astronomical clock] was built in 1410. It has had a rough ride over the centuries. In May, 1945, it took a direct hit from a German cannon and burned down, [but] it was restored. The Orloj will soon be 600 years old, and I'm proud to be continuing the work of some 100 Orloj-keepers before me. It's a beautiful job. The future of mechanical clocks is not bright, however. Most tower clocks in Germany and Austria have already been replaced by electronic timing mechanisms." He was born probably in 1375 in Hradec Kralove (Bohemia). He became a bachelor in 1395 and in February 1399 master (magister arcium) on Prague University. He was the rector of the school at St. Nicholas in the Small Town in Prague from 1406, later he was a teacher of mathematics in Wien, where he studied on the Faculty of Medicine. After his return to Prague he became professor of astronomy on Charles University. Later, in 1410, he became a doctor of medicine, the rector of Prague University and private physician of the king Wenceslas IV. He was also a friend of John Hus. In the period of Hussite wars he was in exile in the Moravian town Olomouc and later he was the physician of the town of Nurnberg (1423-1436 ?) and then - from 1432 - private physician of the emperor Sigismund. In 1436 he returned to Prague. In 1441 he became the dean of Vysehrad capitol. He died between 1455 and 1458. 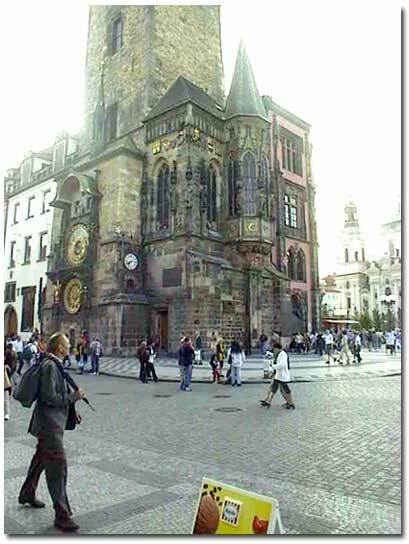 Magister Iohannes is renowned as the astronomer in collaboration with whom the clockmaker Nicolaus of Kadan constructed the famous Astronomical Clock of Prague in 1410 (this dating was done by Z. Horsky, cf. e.g. his 'Prazsky orloj'. Praha, Panorama 1988). According to testimony of Tycho Brahe, Sindel also performed valuable astronomical observations. Recently, Sindel's theoretical treatises on the construction and the use of astronomical instruments were identified. Critical edition of his treatise 'Canones pro eclipsibus Solis et Lune per instrumentum ad hoc factum inveniendis Magistri Iohannis Sindel' (it means 'The rules for a calculation of Sun's and Moon's eclipses according to the instrument invented by Iohannes Sindel') is now in preparation. This treatise is - as far as we know - preserved in three mss. only (two are in Wien, ONB 5415, fol. 133r-141r; ONB 5412, fol. 161r-174r; one in Nurnberg, Stadtbibliothek Cent. V. 58, fol. 116vb-121va). Sindel's eclipse instrument (or rather a nomogram for demonstration), which is described in treatise, was derived from Wallingford's albion (cf. 'Richard of Wallingford.' An edition of his writings with introductions, English translation and commentary by J.D. North. I-III, Oxford, Clarendon Press 1976). All three known manuscripts of Sindel's treatise are in convoluts together with either Wallingford's Albion or its version enlarged by Iohannes von Gmunden. This illustrates the connections between Prague and Wien astronomical schools. Learn how to use the New Headway course books in our 3 hour course via Skype on how to use them. Check out the costs of dental treatment in the Czech Republic and think twice before further sponsoring your own dentist's hobby of owning racehorses.